A fearless mobile robot is helping scientists monitor environmental changes in forests. The hi-tech Tarzan of the robot world, nicknamed Treebot, is the first of its kind to combine networked sensors, a webcam, and a wireless net link. It is solar-powered and moves up and down special cables to take samples and measurements for vital analysis. Treebot has been developed by scientists at the US Centre for Embedded Network Sensing in California. 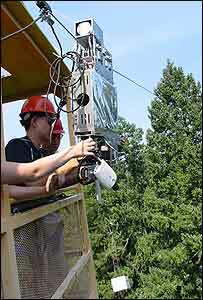 Programmed with open-source computer code, Linux, the Treebot is a vital addition to researchers' environmental monitoring kit, according to one of the project leaders, Professor William Kaiser. "One of our objectives is to make use of distributed sensors to acquire information about the environment," he said. "It is very important in the biology community to understand the interaction between the atmosphere and the forest environment." Understanding subtle changes in light, humidity, and carbon dioxide levels give scientists crucial indications and predictions about environmental change. But 90% of all interaction between the environment and atmospheric conditions happens high up in the forest canopy, and it is a challenge taking detailed measurements and monitoring conditions over a period of time. The Treebot, which in scientific terms is a node in a Networked Infomechanical System (Nims), helps by being stealthy enough to travel through the forest canopy along specially-constructed cabling, night and day. "Using new Nims technology, provides us with a means to place instruments anywhere, moving horizontally and vertically," said Professor Kaiser. "At the same time, we can monitor plants and even individual leaves over time using spectrographic imaging." Eighteen months in development, the main difference between Treebot and other fixed sensors is its autonomous nature and its ability to communicate with other devices and sensors. It has its own server and, using its wireless net link, sends sample information and other data back to scientists based at the University of California (UCLA). They, in turn, can tell it go to specific points of interest and take samples or analyse particular areas. The robot can also lower another sensor deep into the forest to pick up detailed data about conditions, and it talks to other fixed sensors on the ground around the forest. "We need to understand carbon dioxide effects and light - to what extent it makes its way to lower canopy," said Professor Kaiser. Treebot can pinpoint and analyse foliage to see if carbon dioxide has resulted from photosynthesis or from the upper atmosphere. The next stage of the project includes building a website from which schoolchildren can access images and information from Treebot, as well as help with experiments. The team also hope to introduce more Treebots and portable towers so that the entire Nims system can be moved, set up and launched at any location. "We are very excited about this and feel it really is a significant breakthrough in allowing us to have a variety of fixed and mobile sensors, and it gives us a new understanding of our environment," Professor Kaiser said. "We won't be surprised if we uncover an entirely new phenomenon with it." 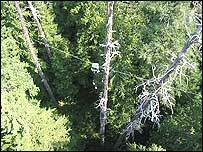 The Treebot, part of wider research funded by the National Science Foundation Science and Technology Center, is set to swing into three forests by early 2004 and has already been successfully used at the Wind River Canopy Crane Research Facility in Washington state.